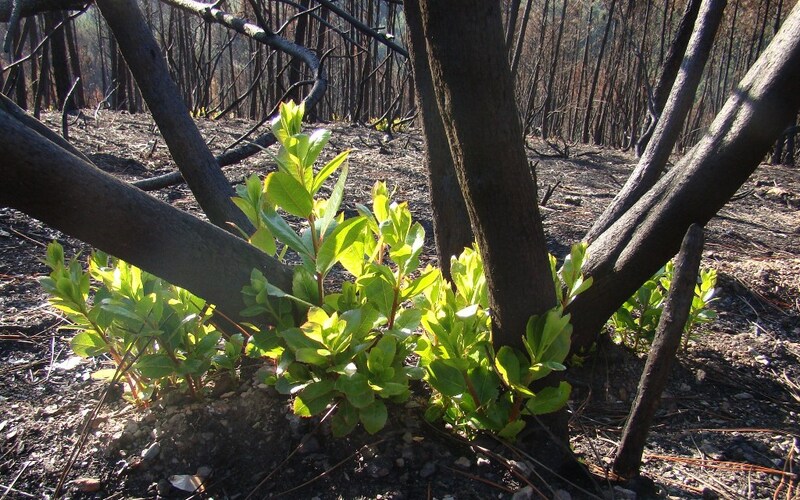 Resprouting is a very important process in plants living in disturbance-prone ecosystems, and the December issue of the journal Plant Ecology is going to be dedicated to this topic (Ecology of plant resprouting in fire-prone ecosystems). During the recent years, and starting from the PERSIST project, we have been comparing functional traits between resprouters and non-resprouters in Mediterranean fire-prone ecosystems, and the last comparison (physiological traits ), is included in this special issue. Resprouters and non-resprouters are two plant syndromes in Mediterranean ecosystems that also differ in their evolutionary history . Resprouters tend to exhibit a deeper root-system than non-resprouters that inverse less resources on roots. So one could think that resprouters are better adapted to drought. However, both resprouters and non resprouters coexist, and non-resprouters counteract their lower root allocation by different traits that confer higher drought resistance . Non-resprouters have higher drought resistance at leave level because they have higher water use efficiency (WUE) and higher leaf mass per area (LMA; i.e., higher sclerophylly, lower SLA) . The seedling root structure of non-resprouters also allows them to more efﬁciently explore the upper soil layer . A recent paper also shows that, when water is non-limiting, non-resprouters showed a better performance of leaf gas exchange traits (higher assimilation, stomatal conductance and transpiration) than resprouters ; that is non-resprouters have higher efﬁciency in resource capture, and thus a better capacity to take advantage of water when it is freely available. In addition, resprouters and non-resprouters also differ in their post-fire germination, as non-resprouters tend to have a greater capacity to both (i) persist after ﬁre by means of recruiting (greater heat-tolerance) and (ii) increase their population after ﬁre (greater heat-stimulated germination), than resprouters . All these results suggest that resprouters and non-resprouters are two contrasted syndromes or functional types in the Mediterranean Basin . Figure: Arbutus unedo resprouting after a fire. Pausas J.G. 2010. Fire, drought, resprouting: leaf and root traits. URL: jgpausas.blogs.uv.es, 22/Oct/2010.